Only days ago, I published an essay on my 2016 acquisitions. One more just arrived from Austria. I didn't include it in the previous essay because it had been stuck in US Customs for weeks due to some combination of Christmas volume and Homeland Security. But now that it is here, I find much to discuss about the lovely book. 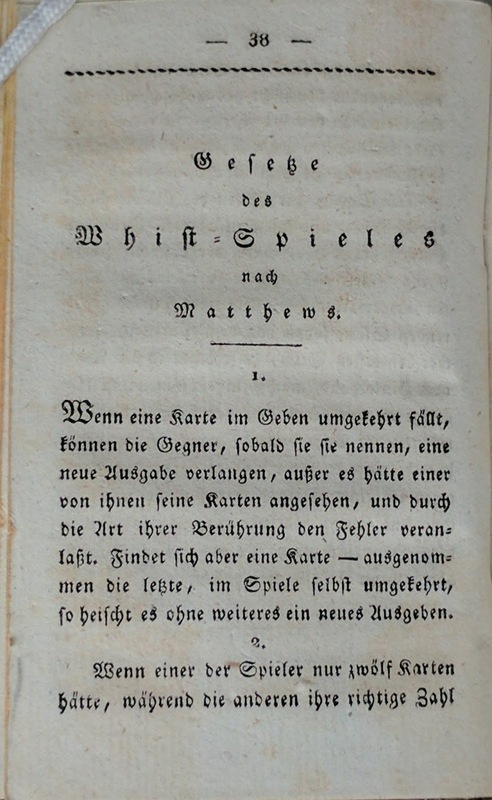 The short title is Gründliche Anweisung zum Whist-Spiele, published in Vienna and Prague in 1821. 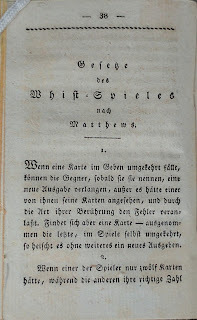 It is an anthology of English whist literature translated into German as is evident from a phrase in the long title: "based on examples after the best information of the old as well as the new school from Hoyle to Matthews". The binding is boards covered with marbled paper and a red leather label on the spine reading "Adams, Whist Spiele." 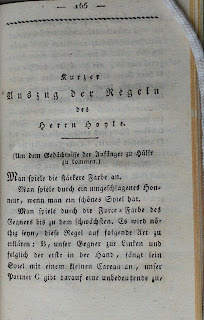 I've never been a huge fan of German books of this era. The fraktur is a challenge for me. 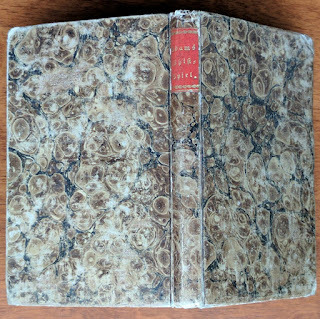 The paper generally does not feel good to the touch and the binding is often brittle (though not in this case). This book may be the one to help me overcome my biases--I find it rather charming! 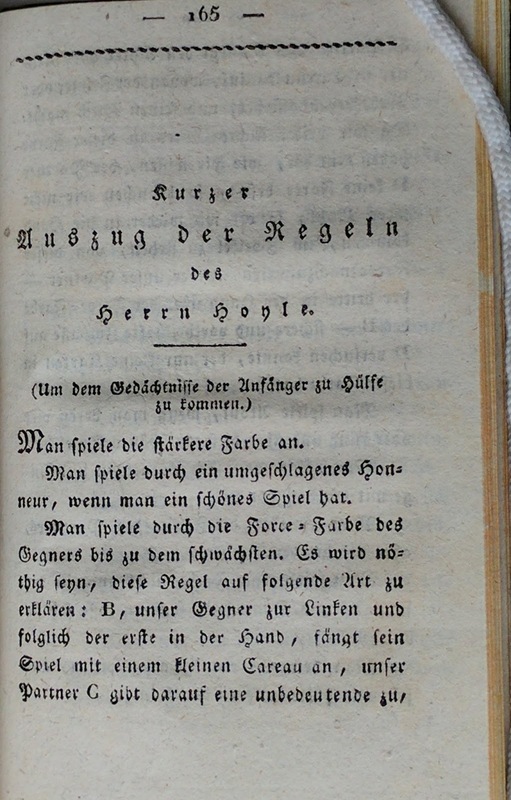 I cannot read the German, but the book has chapters excerpting the important English writers on whist. There is Herrn Hoyle. 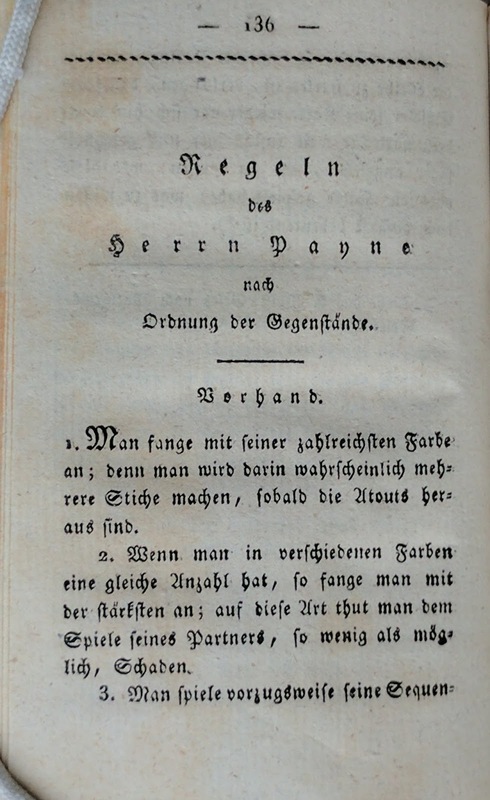 After Hoyle, Herrn William Payne wrote Maxims for the Game of Whist. 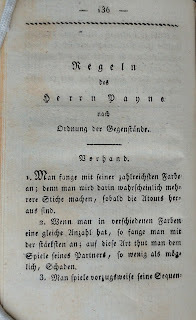 I discuss Payne's writing in the essay "The Most Important Hoyle After Hoyle". 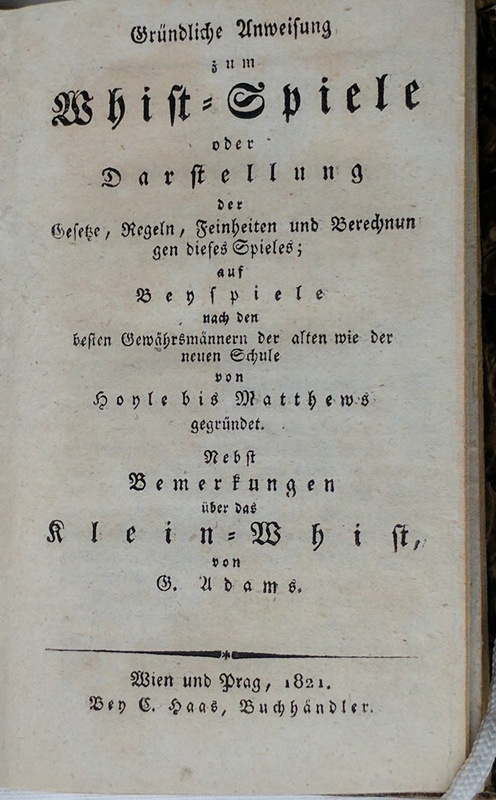 Most of Adams' book is a translation of Thomas Matthews Advice to the Young Whist Player, an important and frequently-reprinted work I discuss here. And somewhat surprisingly, there are excerpts from Charles Pigott's New Hoyle. 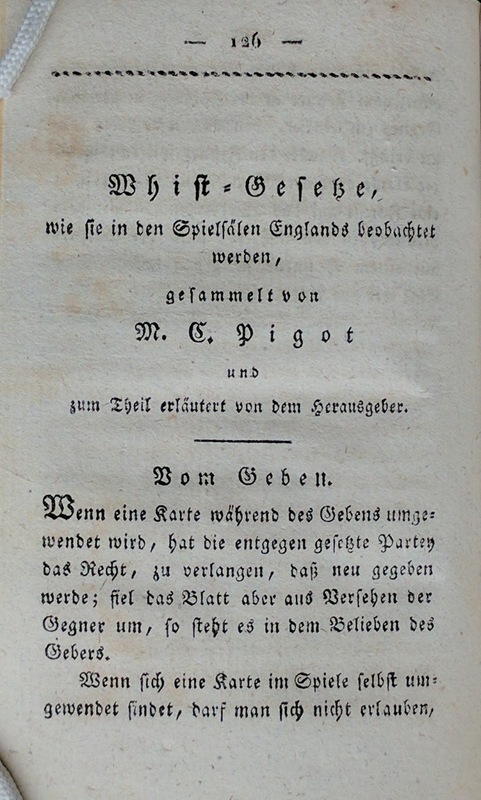 New material did appear in later editions of Pigott, all published by James Ridgway after Pigott's death, but they were not about whist, but about other games. 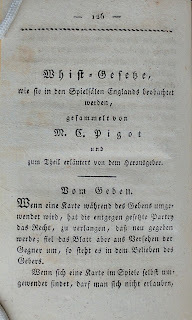 See "The Pigott Hoyles" for a list of editions of his books. All in all, a lot for a small 196 page work! Now, a conundrum. Do I shelve it with my whist books or with my Hoyle's? There is one other thing I find interesting. The signature marks have a different pattern from anything I've ever seen. 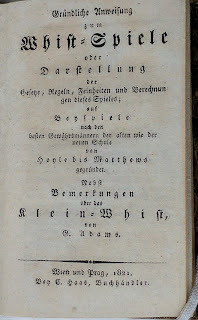 The book is a duodecimo, regularly gathered in eights and fours. The first leaf of each gathering is signed numerically 1-16, but the second leaf of each eight-leaf gathering is signed 1*, 3* ... 15*. Only the first leaf is signed in the four-leaf gatherings. I've posted a query to book lists EXLIBRIS-L and SHARP-L to learn if this is typical of the time and location. As I said it's new to me. There is one other 2016 purchase that is on it's way from Italy, but based on my experience with this book, I can't imagine it clearing customs until the New Year. Read about it perhaps a year from now.